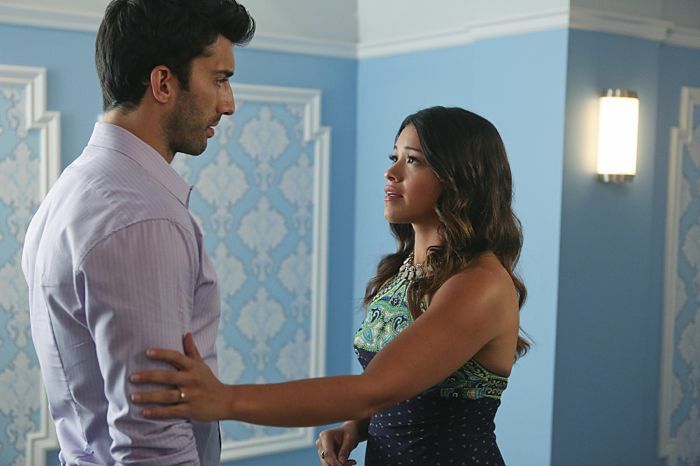 JANE THE VIRGIN Season 1 Episode 3 Photos Chapter Three : A TANGLED WEB — Jane (Gina Rodriguez) considers making a life-changing decision about her and Michael’s (Brett Dier) relationship. Alba (Ivonne Coll) is disappointed in Xo’s (Andrea Navedo) handling of Rogelio (Jaime Camil), so Alba takes it into her own hands to stop Rogelio from trying to see Jane. Meanwhile, Jane continues to question whether Petra (Yael Grobglas) will be a fit mother, and her pursuit of the truth leads to an unexpected change in their relationship. Michael’s on-going murder investigation leads to an unexpected discovery. Justin Baldoni also stars. Brad Silberling directed the episode written by Meredith Averill (#103). Original airdate 10/27/2014.